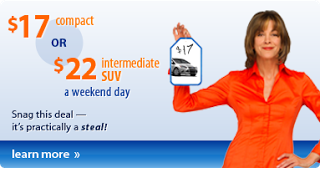 This must be the perfect time to announce Fall and Winter deals on weekend car rentals. Last week, Enterprise announced the return of their popular $9.99 Weekend Deal and today Budget is stepping it up with the return of its own special offer for weekend rentals. While it may seem hard to beat a $9.99 per day deal, the Enterprise deal has a few shortcomings (not valid at airports, 100 mile per day limit). The deal is valid at participating Budget airport locations in the U.S. from August 15, 2013 through December 15, 2013. Weekend rental period begins Thursday at noon and car must be returned by Monday 11:59 p.m. Thursday and Friday checkouts require a Friday night overstay. Unlike the Enterprise weekend deal which is valid only in neighborhood locations, this deal is valid only at airport locations. So, if you're thinking of picking up a car at the Budget location around the block this weekend, this deal is not for you. Rental cars at airport locations tend to have higher taxes than similarly priced rentals at neighborhood locations. The deal is only valid at participating locations and specifically exclude New York and Hawaii. You were expecting that, weren't you? $10 - $20 off coupon for weekend rentals. The best part is that the coupon can be combined with a contract code (AWD, BCD, CDP) to double up on discount and save even more! A pretty good deal that has been around for a few years now (excluding the summer months) that has the potential to save you a lot of money on your next weekend rental. This is a pretty good DEAL.